Justification: lettering and style (Steinhauer). Aixone in Attica. The earlier fragment of the stele caused some confusion as to its provenance. The new fragment confirms the provenance from the deme of Aixone (modern Glyfada). See Steinhauer for a fuller description of the finds, but cf. esp. the brief notice of SEG: "It was found near other inscriptions mentioning their being set up in the sanctuary of Herakleidai, Hebe and Alcmene." The stone is now in the Museum of Piraeus (inv. no. 5281). Two joining fragments of a marble stele. Stoichedon 40, carefully inscribed, with grid lines. Each deity mentioned in the account is prefixed by a small (one-letter) empty space, to facilitate consultation. Each numeral in the first part of the fragment is carefully demarcated by punctuation before and after it (with some exceptions, e.g. in line 8). From line 28 onward, however, this practice is discontinued. Edition here based on Steinhauer 2004. For the earlier fragment, see: IG II² 1356. Cf. also: Sokolowski LSCG 28 (earlier fragment only); SEG 54, 214. Further bibliography: Ekroth 2002; Ackermann 2007; Scullion 2009; Parker 2010b; Ackermann 2011. [...] for a half-hekteus of barley-groats: 3 obols; for a kotyle of honey: 3 obols; for three kotylai of olive-oil: 1.5 obols; for kindling wood: 2 obols; on the table, a thigh, a side of hip, a half-head stuffed with intestines (or half a 'head' of sausage?). (5) To the priestess of the Heroine (? ), as priestly emoluments: 5 drachmae; the skins of the animals sacrificed during all the heroinia; for an adult animal whose the skin has been singed: 3 dr.; an (equal) share of the meat; for a half-hekteus of barley-groats: 3 obols; for a kotyle of honey: 3 obols; for three kotylai of olive-oil: 1.5 obols; for kindling wood: 2 obols; on the table, a thigh, a side of hip, a half-head stuffed with intestines (or half a 'head' of sausage?). For the priestess of Dionysus Anthios: (10) as priestly emoluments: 5 dr.; the skin of the he-goat; on the table, a thigh, a side of hip, a half-head stuffed with intestines (or half a 'head' of sausage?). For the priestess of Hera: for priestly emoluments: 5 dr.; (the hide) of the ewe; for an adult animal whose skin has been singed: 3 dr.; an (equal) share of the meat; for a half-hekteus of barley-groats: 3 obols; for a kotyle of honey: 3 obols; for 3 kotylai of olive-oil: 1.5 obols; for kindling wood: 2 obols; on (15) the table, a thigh, a side of hip, a half-head stuffed with intestines (or half a 'head' of sausage?). For the priestess of Demeter Chloe: as priestly emoluments: 5 dr.; an (equal) share of the meat; for a half-hekteus of barley-groats: 3 obols; for a kotyle of honey: 3 obols; for 3 kotylai of olive-oil: 1.5 obols; for kindling wood: 2 obols; on the table, a thigh, a side of hip, a half-head stuffed with intestines (or half a 'head' of sausage?). For the priestess of [...]: (20) as priestess emoluments: 5 dr.; the hide of the ewe; an (equal) share of the meat; for a half-hekteus of barley-groats: 3 obols; for a kotyle of honey: 3 obols; for 3 kotylai of olive-oil: 1.5 obols; for kindling wood: 2 obols; on the table, a thigh, a side of hip, a half-head stuffed with intestines (or half a 'head' of sausage?). For the priestess of Hagne Theos: as priestly emoluments: 5 dr.; for a third of a medimnos of barley: 1 dr.; for a hekteus of barley groats: (25) 1 dr.; for 2 kotylai of honey: 1 dr.; for three kotylai of olive-oil: 1.5 obols; for a chous of wine: 2.5 obols; for kindling wood: 2 obols; for wood for burning: 3 dr. To the priest of Hagne Theos, the same as for the priestess, and for both of them the hides of animals sacrificed and 20 dr.
For the priest of Paralos: as priestly emoluments: 5 and 10 dr. (i.e. 15 dr.); the hide of the male sheep; for a hekteus of barley-groats: 1 dr.; for two kotylai of honey: 1 dr.; (30) for three kotylai of olive-oil: 1.5 obols; for a quarter of a medimnos of barley: 4.5 obols; for two choes of wine: 5 obols; for kindling wood: 2 obols. For the priest of Archegetes and the other heroes: as priestly emoluments: 5 dr.; the skins of the animals from which first offerings have been made; on the brazier, for a half-hekteus of barley-groats: 3 obols; for three kotylai of olive-oil: 1.5 obols; for a kotyle of honey, 3 obols; when (the offering is made on) the table, (35) for two choinikes of barley-groats: 1.5 obols; for two kotylai of olive-oil: 1 obol; for a half-kotyle of honey: 1.5 obols; for kindling wood: 2 obols. When one of the pentekostyes sacrifices in the heroa (? ), it is provide for the table two choinikes of barley-groats, two kotylai of olive-oil, a half-kotyle of honey. [...], pour un demi-setier de froment : 3 oboles; pour un kotyle de miel : 3 oboles; pour trois kotyles d’huile : 1 ½ obole; pour du bois d'allumage : 2 oboles; sur la table, une cuisse, un côté de hanche (? ), une demi-tête farcie de boyaux (?). (5) À la prêtresse de l’Héroïne (? ), en guise de rémunération : 5 drachmes; les peaux des animaux sacrifiés lors de tous les heroinia; pour un animal sacrificiel adulte dont la peau a été roussie : 3 dr.; une part (égale) de viande; pour un demi-setier de froment : 3 oboles; pour un kotyle de miel : 3 oboles; pour trois kotyles d’huile : 1 ½ obole; pour du bois d'allumage : 2 oboles; sur la table, une cuisse, un côté de hanche, une demi-tête farcie de boyaux (?). À la prêtresse de Dionysos Anthios, (10) en guise de rémunération : 5 dr.; la peau du bouc; sur la table, une cuisse, un côté de hanche, une demi-tête farcie de boyaux (?). À la prêtresse d’Héra, en guise de rémunération : 5 dr.; la peau de la brebis; pour un animal sacrificiel adulte dont la peau a été roussie : 3 dr.; une part (égale) de viande; pour un demi-setier de froment : 3 oboles; pour un kotyle de miel : 3 oboles; pour trois kotyles d’huile : 1 ½ obole; pour du bois d'allumage : 2 oboles; sur (15) la table, une cuisse, un côté de hanche, une demi-tête farcie de boyaux (?). À la prêtresse de Déméter Chloè, en guise de rémunération : 5 dr.; une part (égale) de viande; pour un demi-setier de froment : 3 oboles; pour un kotyle de miel : 3 oboles; pour trois kotyles d’huile : 1 ½ obole; pour du bois d'allumage : 2 oboles; sur la table, une cuisse, un côté de hanche, une demi-tête farcie de boyaux (?). À la prêtresse de [...], (20) en guise de rémunération : 5 dr.; la peau de la brebis; une part (égale) de viande; pour un demi-setier de froment : 3 oboles; pour un kotyle de miel : 3 oboles; pour trois kotyles d’huile : 1 ½ obole; pour du bois d'allumage : 2 oboles; sur la table, une cuisse, un côté de hanche, une demi-tête farcie de boyaux (?). À la prêtresse d’Hagnè Theos, en guise de rémunération : 5 dr.; pour un tiers de médimne d’orge : 1 dr.; pour un hecte de froment : (25) 1 dr.; pour deux kotyles de miel : 1 dr.; pour trois kotyles d’huile : 1 ½ obole; pour un chous de vin : 2 ½ oboles; pour du bois d'allumage : 2 oboles; pour du bois : 3 dr. Au prêtre d’Hagnè Theos, la même chose qu’à la prêtresse, et pour les deux les peaux des bêtes sacrifiées et 20 dr. Au prêtre de Paralos, en guise de rémunération : 5 et 10 dr. (i.e. 15 dr.); la peau du mouton mâle; pour un hecte de froment : 1 dr.; pour deux kotyles de miel : 1 dr.; (30) pour trois kotyles d’huile : 1 ½ obole; pour un quart de médimne d’orge : 4 ½ oboles; pour deux choes de vin : 5 oboles; pour du bois d'allumage : 2 oboles. Au prêtre de l’Archégète et des autres héros, en guise de rémunération : 5 dr.; les peaux des bêtes sacrifiées; sur le brasier, pour un demi-setier de froment : 3 oboles; pour trois kotyles d’huile : 1 ½ obole; pour un kotyle de miel : 3 oboles; quand (l’offrande a lieu sur) la table, (35) pour deux chénices de froment : 1 ½ obole; pour deux kotyles d’huile : 1 obole; pour un demi-kotyle de miel : 1 ½ obole; pour du bois d'allumage : 2 oboles. Quand l’une des pentekostyes fait un sacrifice en quelque endroit (?) dans les heroa, fournir sur la table deux chénices de froment, deux kotyles d’huile, un demi-kotyle de miel. The authority issuing this financial and sacrificial account is not completely clear, though the likeliest candidate is the deme of Aixone itself. A more widely based genos is also possible, since the inscription notably mentions the hero Paralos (line 28), based in the Piraeus, which fell outside of Aixone's control. Yet a local cult of this hero also cannot be excluded. An enigmatic series of groups called a pentekostyes are mentioned in the final lines (36-37): cf. Ackermann 2011 for an interpretation of this type of group as a subdivision of the deme. The deme or the other relevant authority will have been responsible for funding the sacrifices and also with providing the financial backing for the other ritual supplies which are listed in the account. Regrettably, any relevant information in the title or preamble of the inscription is now lost. As we have it, the account appears to be almost wholly concerned with providing an itemised list of prerogatives and money due to priests and priestesses. The list appears to be organised first by deity, then by priesthood, though any reason behind the precise ordering given is not immediately discernible. The priestly personnel is to be remunerated in two different fashions: with payment in kind (meat or hides) and with payment in cash (money to buy necessary provisions). The two categories are for the most part strictly differentiated from one another. Mentioned as the first prerogative is a sum of money called ἱερεώσυνα, which appears to be lump sum of cash given to the priest or priestess as an emolument for his or her duties: this sum is given in every attested case and always totals 5 drachmae (cf. Ackermann 2007). Next follow the other prerogatives: a mixture of hides, portions of meat (δεισίας κρεῶν), and other provisions such as grains, liquids and firewood for burning. The latter provisions are never provided in kind and sums of money are stipulated, which are demarcated with punctuation. These sums would be given to the personnel in order to insure the correct supply of other necessities in the sacrifice, whether liquids or grains or wood for burning. Meat or other animal portions are almost never followed by a sum of money, with one significant exception. This is in the case where the priest or priestess must apparently be compensated for the loss of a hide or other perquisites: this occurs for instance in lines 6 and 12-13 (see below). A final item in the lists is usually a standard list of portions of meat "on the cult-table", which are attributed to the priest or priestess. Given the fairly repetitive character of the account, we note here some general trends before discussing the cults and other salient differences in the list in the line-by-line commentary. As they are particularly connected with the character of the cult, hides will be discussed in the separate cases below. The portion of meat sometimes given to the priest or priestess is in theory an egalitarian share of the animal, when it was butchered and divided after the sacrifice. The word used, δεισίας, is rare, but points to the distribution of meat which must have taken place within the deme or group: cf. Hsch. s.v. δεισιάδα (acc. )· τὴν μοῖραν, οἱ δὲ διμοιρίαν (the latter potentially indicating that it may have been special "double-portion" of meat reserved for these officials). This portion is omitted in the cult of Dionysus Anthios, Hagne Theos, and the heroes Paralos and Archagetos, probably because these sacrifices did not entail an egalitarian distribution of meat among the participants; see below for further discussion of these cults. Among the other items reimbursed to the priests and priestesses are some recurring provisions: a hemi-hekteus of wheat is mentioned in almost every case except that of Dionysus Anthios (in the case of Hagne Theos and Paralos, it is double: a hekteus); a kotyle of honey likewise (it is omitted only in the case of Dionysus Anthios; again doubled in the case of Hagne Theos and Paralos); three kotylai of olive-oil are standard (but again not in the cult of Dionysus Anthios, apparently); and finally, firewood worth 2 drachmae is always mentioned (with the usual exception of Dionysus Anthios). The purpose of these condiments may have been to make cakes, libations and other ritual gestures around the sacrificial altar. Other differences are discussed below. The portions "on the table" which are usually cited last in the lists are also a standard set and occur in the same order: a thigh from the animal, a "side of the hip", and a portion called a ἡμίκραιρα χορδῆς. These portions parallel particularly well those listed in other Athenian inscriptions, cp. e.g. CGRN 103, lines 5, 16-17, 20-21, as well as Amipsias fr. 7 ap. Athen. 368e. The thigh is a standard portion from one of the rear legs of the animal. The side of the hip is somewhat more intriguing; presumably this refer to a portion from the left- or righthand side of the hip. It is possible that this may have been joined with the thigh given on the table and then to the priest: cf. CGRN 138 (Miletos), lines 16-18. The final portion is the most enigmatic: ἡμίκραιρα similar to the thigh and the side of hip properly refers to one of the two hemispheric sides of the head (cp. again Amipsias and other sources); χορδή properly refers to intestines or to sausages made from these. According to Ackermann's plausible interpretation, we should probably think of a half-head "stuffed with" bowels or sausage, though the genitive part of this expression remains problematic. An alternative voiced by Scullion is that ἡμίκραιρα might refer to a typical portion or "head" of sausage, but we find this somewhat less plausible. Lines 1-4: The identity of this first cult is missing, and given the repetitive character of the lists, is impossible to reconstruct. Lines 5-9: The cult served by a priestess is that of an unknown heroine. Typical animals sacrificed in this cult are apparently known as ἡρωινία, an unattested word. What exactly these included is unclear. The priestess is to receive the hides of these animals, while in another sacrifice, known as εὑστόν or εὐστόν, the hide was apparently singed directly on the carcass of the animal itself. It was thus not treated as a separate portion and the priestess needed to be compensated for this loss of the usual prerogative (here, with 3 drachmae; cf. Scullion; for a different view, see Ackermann). For this form of sacrifice, cp. also here CGRN 100 (Miletos), lines 5-6. Cp. and contrast also the burning of the skin separately in some rituals, e.g. at CGRN 52 (Erchia), col. Γ, lines 11-12; col. Δ, lines 11-12. Lines 9-11: As attested from the priestly perquisites, the sacrifice to Dionysios Anthios is notably different in several regards (also alluded to above). No standard meat distribution is apparently envisaged, nor are any sacrificial complements such as grain, liquids or firewood. There are two major possibilities: first, it may be that the priestess was simply not reimbursed for these expenses in this particular case; second, the absence of the other usual elements of the lists indicates something significant about the ritual. The second possibility seems more attractive to us. It is possible that the sacrifice as we have it reflects an absence of burning, something which is sometimes found in rituals for Dionysus, which can involve singeing the skin of an animal as well as raw portions of meat which could be deposited on the altar or in another area: cp. esp. again CGRN 138 (Miletos), line 2; for this suggestion, see also Parker. The skin of a he-goat is given the priestess, perhaps indicating that this was the standard (single) animal offered in this cult. Notwithstanding these particularities, the habitual portions of the animal are given on the cult-table. Whatever the case may be, the epithet Anthios is seldom attested for Dionysus and suggests a cult that has a connection with the Spring or with the flowering of the vines. Lines 11-16: The sacrifice for Hera contains all of the usual elements in the account, but again differentiates the sacrifice of a ewe—perhaps the usual animal offered in the cult—from that of an adult animal called εὑστόν or εὐστόν (see above at lines 5-9). The presence of the latter form of sacrifice in the cult of Hera is perhaps at first glance surprising, but cp. again how it can be found in that of Apollo or other gods, CGRN 100 (Miletos), line 5. At any rate, it does not appear to have had any "Chthonian" connotation, whatever that might mean for a goddess such as Hera. Lines 16-19: The priestess of Demeter Chloe receives all of the usual portions and other provisions, except the hides of the animals. According to Ackermann 2007, this may be linked to the fact that pigs or piglets would be offered in this cult; the skins of these animals might be singed and distributed along with the portions of meat rather than as a separate hide. On Demeter Chloe, associated with the verdant growth of the spring or summer, cf. here CGRN 25 (Paiania), lines 25-26, and CGRN 32 (Thorikos), line 38. Lines 19-23: The recipient of this cult is regrettably missing, but was likely a goddess given the ending preserved at the beginning of line 20 and the fact that the cult is served by a priestess. The identity cannot be reconstructed from the standard list preserved under this entry, though it may be noted that, like Hera, this goddess also received a ewe. Lines 23-28: The cult included in the account which has caused the most questioning is that of Hagne Theos. We accept the proposal of Parker that this is an unusual appellation for Persephone/Kore (cp. also Scullion—Demeter is another possibility), rather than an allusive mention of another mysteric goddess (for the latter, see the interpretation of Ackermann 2007, with a wider and valuable discussion of this theonym). Parker's hypothesis is particularly attractive given that it begins to explain several of the features of the cult as they are presented in the account, notably its duality (Demeter and Kore are notably called the "Twin" goddesses, see here CGRN 8, Eleusis, line 5; etc). At Aixone, Hagne Theos has a both a female and a male priest, which perhaps, though more tentatively, suggests that Plouton or Hades may lie behind the male aspect of the cult. The provisions of wheat, honey and oil given to the priestess are double what is usually provided in the account (see also the sacrifice to Paralos, below, lines 27-31). This might indicate that two animals or at least a large sacrifice is presumed by the rituals (so Scullion), a possibility which seems to be confirmed by the phrase καὶ τῶν θυομένων τὰ δέρματα ἀμφοῖν; this ought properly to mean "and the skins of the sacrificial animals for both", i.e. probably "for both the priestess and the priest" of Hagne Theos. Additionally, the fact that the priest of Hagne Theos receives 20 drachmae must denote a reimbursement for the purchase of sacrificial animals, probably 2 sheep. The phrase ταὐτὰ ἅπερ τῆι ἱερείαι indicates that the priest of Hagne Theos also received double-measures as well as the usual prerogative of 5 drachmae. As in the sacrifices which do not involve an egalitarian distribution of meat and for which only the hides are given to the priest or priestess, it may be presumed that an unusual sacrifice took place: in this case, probably partial or near-total holocausts (cf. again Scullion). This would also fit with the sizeable amount of burning wood (ξύλον), worth 3 drachmae (or 6 drachmae if we include an equal sum given to the priest), to be provided; indeed, this stipulation is unique in the account. This would have provided about 2 or 4 talents of wood, according to Ackermann's calculations (2007). Contrast the sacrifice to Dionysus Anthios, discussed above at lines 9-11, where neither kindling nor burning wood is mentioned, since the meat was probably consumed raw. Lines 27-31: For the associational cult of the hero Paralos in the Piraeus, cf. IG II² 1254 (ca. 350-300 BC). The measures of most of the supplies are doubled as in the case of Hagne Theos and therefore show some similarities with those sacrifices, though the quantity of wood is lesser (see immediately above at lines 23-28). A sum of 10 drachmae has been added as a later correction to the usual ἱερεώσυνα of 5 drachmae for the priest; this indicates the need for reimbusement for a single sacrificial, probably a single sheep (see the discussion of Ackermann 2007). A partial holocaust of a male sheep might be presumed in this case then (see the hypothesis of Scullion, with further discussion), but note that the absence of burning wood, ξύλον, does not help to further clinch this point. Such differences are salutary reminders that seldom are two Greek sacrifices precisely alike. Lines 31-36: The priest of the hero called Archagetos is also said to serve as priest for all other heroes in the deme or as part of the relevant group. The Archagetes of the deme of Aixone is only known from a passing reference (cf. Pl. Lys. 205d), but such "Leaders" are known for gene, tribes and other groups at Athens. The account provides evidence for specific rituals in the cases of these heroic rituals also. The priest receives hides from the animals which have been consecrated (lit. 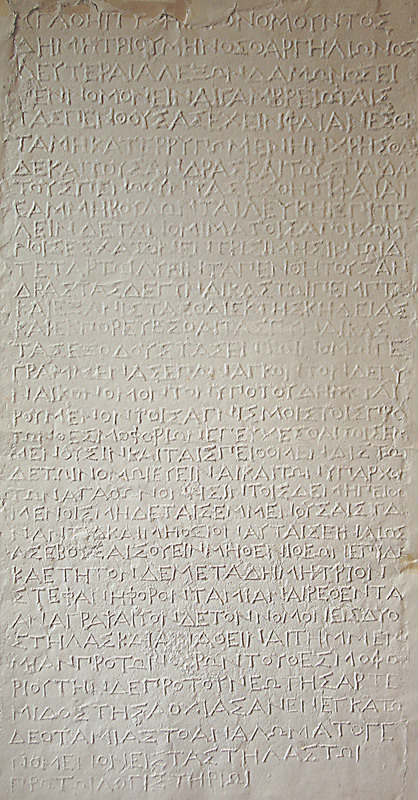 "those from which first offerings have been made"): τά δέρματα ὧν ἂν κατάρξηται (line 32; cp. CGRN 84, Salaminioi, lines 31-33). Standard provisions for the list are specifically to be attributed "for the brazier", ἐπὶ δὲ τὴν ἐσχάραν, probably by implicit contrast with an altar. For the role of ἐσχάραι in heroic cults, to which they were not wholly specific, cf. generally Ekroth 2002. Whenever a cult-table is to be dressed, perhaps as a theoxenia offered for the heroes, other standard yet also somewhat different provisions of wheat, oil, honey and kindling wood are to be supplied. Lines 36-39: This concluding portion of the account appears to envisage provisions which will be independently supplied and financed by individual members of the pentekostyes who wish to offer a sacrifice in the sanctuaries of heroes (heroa). It is not known whether ΠΟ(X) in line 37 is an abbreviation or a particle (viz. που), adding to the uncertainty of the interpretation. No direct compensation to the priest is envisaged since the standard perquisites, for instance those given to the priest of the Archagetos, will have applied. CGRN 57, l. x-x (http://cgrn.philo.ulg.ac.be/file/57/). <p>Given the fairly repetitive character of the account, we note here some general trends before discussing the cults and other salient differences in the list in the line-by-line commentary. As they are particularly connected with the character of the cult, hides will be discussed in the separate cases below. The portion of meat sometimes given to the priest or priestess is in theory an egalitarian share of the animal, when it was butchered and divided after the sacrifice. The word used, δεισίας, is rare, but points to the distribution of meat which must have taken place within the deme or group: cf. Hsch. s.v. δεισιάδα (acc. )· τὴν μοῖραν, οἱ δὲ διμοιρίαν (the latter potentially indicating that it may have been special "double-portion" of meat reserved for these officials). This portion is omitted in the cult of Dionysus Anthios, Hagne Theos, and the heroes Paralos and Archagetos, probably because these sacrifices did not entail an egalitarian distribution of meat among the participants; see below for further discussion of these cults. Among the other items reimbursed to the priests and priestesses are some recurring provisions: a hemi-<foreign>hekteus</foreign> of wheat is mentioned in almost every case except that of Dionysus Anthios (in the case of Hagne Theos and Paralos, it is double: a <foreign>hekteus</foreign>); a <foreign>kotyle</foreign> of honey likewise (it is omitted only in the case of Dionysus Anthios; again doubled in the case of Hagne Theos and Paralos); three <foreign>kotylai</foreign> of olive-oil are standard (but again not in the cult of Dionysus Anthios, apparently); and finally, firewood worth 2 drachmae is always mentioned (with the usual exception of Dionysus Anthios). The purpose of these condiments may have been to make cakes, libations and other ritual gestures around the sacrificial altar. Other differences are discussed below. The portions "on the table" which are usually cited last in the lists are also a standard set and occur in the same order: a thigh from the animal, a "side of the hip", and a portion called a ἡμίκραιρα χορδῆς. These portions parallel particularly well those listed in other Athenian inscriptions, cp. e.g. <ref target="http://cgrn.ulg.ac.be/CGRN_103">CGRN 103</ref>, lines 5, 16-17, 20-21, as well as Amipsias fr. 7 ap. Athen. 368e. The thigh is a standard portion from one of the rear legs of the animal. The side of the hip is somewhat more intriguing; presumably this refer to a portion from the left- or righthand side of the hip. It is possible that this may have been joined with the thigh given on the table and then to the priest: cf. <ref target="http://cgrn.ulg.ac.be/CGRN_138">CGRN 138</ref> (Miletos), lines 16-18. The final portion is the most enigmatic: ἡμίκραιρα similar to the thigh and the side of hip properly refers to one of the two hemispheric sides of the head (cp. again Amipsias and other sources); χορδή properly refers to intestines or to sausages made from these. According to Ackermann&apos;s plausible interpretation, we should probably think of a half-head "stuffed with" bowels or sausage, though the genitive part of this expression remains problematic. An alternative voiced by Scullion is that ἡμίκραιρα might refer to a typical portion or "head" of sausage, but we find this somewhat less plausible. <p>Lines 5-9: The cult served by a priestess is that of an unknown heroine. Typical animals sacrificed in this cult are apparently known as ἡρωινία, an unattested word. What exactly these included is unclear. The priestess is to receive the hides of these animals, while in another sacrifice, known as εὑστόν or εὐστόν, the hide was apparently singed directly on the carcass of the animal itself. It was thus not treated as a separate portion and the priestess needed to be compensated for this loss of the usual prerogative (here, with 3 drachmae; cf. Scullion; for a different view, see Ackermann). For this form of sacrifice, cp. also here <ref target="http://cgrn.ulg.ac.be/CGRN_100">CGRN 100</ref> (Miletos), lines 5-6. Cp. and contrast also the burning of the skin separately in some rituals, e.g. at <ref target="http://cgrn.ulg.ac.be/CGRN_52">CGRN 52</ref> (Erchia), col. Γ, lines 11-12; col. Δ, lines 11-12. <p>Lines 36-39: This concluding portion of the account appears to envisage provisions which will be independently supplied and financed by individual members of the <foreign>pentekostyes</foreign> who wish to offer a sacrifice in the sanctuaries of heroes (<foreign>heroa</foreign>). It is not known whether ΠΟ(X) in line 37 is an abbreviation or a particle (viz. που), adding to the uncertainty of the interpretation. No direct compensation to the priest is envisaged since the standard perquisites, for instance those given to the priest of the Archagetos, will have applied.